Mix in the sugar and the flour, add the egg yolks, the baking powder, the corn starch and the lemon juice. Pour the batter into a cake form greased with butter and sprinkled with flour. Bake at 180°C or 350°F for about 45 minutes. Mix the milk with the corn starch, add the sugar and stir well. When the cream is thick, add the yolks and vanilla sugar and stir some more. After the cake is cooled, cut in half (2 layers) and stuff with the cream. Cover the cake with the remaining cream and sprinkle with grated coconut. 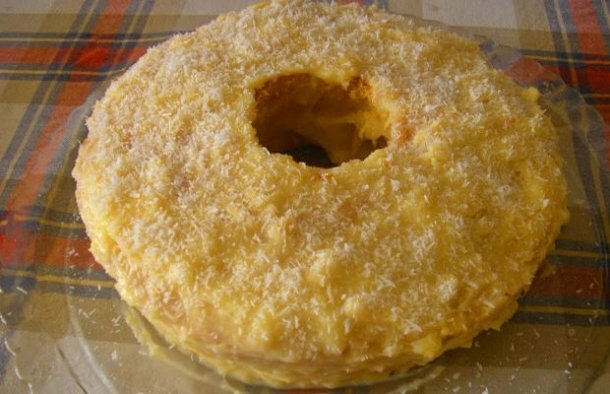 This very simple and quick Portuguese simple cake recipe makes a delicious cake, enjoy. 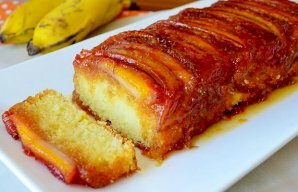 This incredibly delicious and moist Portuguese banana caramelized cake (bolo de banana caramelizado) will leave you craving for more. 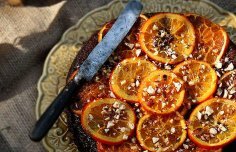 How to make Portuguese honey, orange and hazelnut cake.